What is the cost of violating our basic labour laws for Ontario businesses? Well, the Inspection Blitz Report released today by the Ministry of Labour shows that the cost is pretty insignificant – of 77 repeat offenders, only 27 employers were given a ticket (starting at $250) for their offence. When employers face no real cost for unpaid overtime, vacation and public holiday pay, it sends a green light to them to keep on ignoring the law. Today’s report documents a Repeat Violator Inspection Blitz conducted last fall by the Labour Ministry focusing on employers that had previously been found in violation of the law. The blitz revealed that over 74% of these businesses still continued breaking the law. These numbers provide further evidence for the urgent need for effective strategies to make sure that workers’ rights are enforced. Employers should face mandatory penalties and consequences when they do not follow basic employment law. Repeat violators are clearly not hearing the message by the Ministry of Labour so more targeted prosecutions are needed. Similarly, the damages and interest on wages owed should be paid to the worker who has suffered. The ongoing review of our employment standards and labour laws through the Changing Workplaces Review presents a very important opportunity to close this gap. 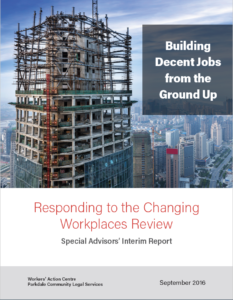 As we included in our response to the Special Advisors’ Interim Report, Building Decent Jobs from the Ground Up, we strongly recommend a deterrence model of enforcement that prevent illegal activities from taking place. This can include mandatory fines, prosecutions as well as suspension of governmental licences to secure compliance. The cost of allowing employers to continue violating the law is too high. Businesses that follow the law face unfair competition by those that don’t. The high rate of repeat violations tells us that the employers detected through inspection blitzs are just the tip of the iceberg. Since 2009, more than one-third of stolen wages in the province have not been collected at all; that’s about $28 million in workers unpaid wages. With the Special Advisors currently writing their final recommendations to the Ontario Government, we believe now is the time to put an end to wage theft and repeat violations of law. We need strong laws and strong enforcement measures!